A tribute to the legendary Lester Young by the San Francisco based multi talented reed specialist, Noel Jewkes, here heard on what else--tenor sax! A tribute to Lester Young is the natural catalyst for this wonderful CD from the brilliant, masterful saxophonist Noel Jewkes. A legend among legends, Lester Young was one of the greatest figures in the history of jazz whose power and spirit transcended the tenor saxophone idiom, affecting the entire sound of jazz. Despite Young's pervasive effect, there has been a shortage of special tributes honoring his contributions to the birth of modern jazz. Jewkes is an original musician, a premier tenor saxophonist, and an alto, soprano, clarinet and flute player, based in the San Francisco Bay Area. This recording, leading a band of top-ranked jazz musicians, has been long overdue and is both a tribute to Lester Young and a jazz celebration of Noel Jewkes. 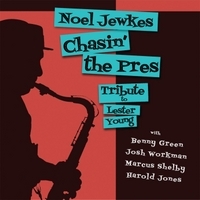 The “Young Effect” prompted Young to be nicknamed “The President” or just “Pres.” As this CD demonstrates, Jewkes' ability to subtly unfurl nuances of jazz harmony and improvisation qualifies him as a member of Young's “Presidential cabinet.” The release of this CD fortifies Jewkes' solid reputation and will be welcomed by dedicated fellow musicians and enthusiastic fans alike. Noel Jewkes was born in Utah on June 18, 1940. His mother, father, and uncles were all musicians: they formed the Jewkes Orchestra swing band, playing cowboy and country-western music for locals at church, school and other social functions. Jewkes joined the band at age 12, playing both clarinet and saxophone. Immersed in a deep musical environment, he became adept at a variety of instruments. He later attended college and studied music privately. Jewkes moved to the San Francisco Bay Area and continued his musical growth and development, soon becoming one of San Francisco's bright lights, playing and recording on a very high level. He worked with Jon Hendricks and Jimmy Witherspoon, appearing in “Evolution of the Blues” production. He also worked with Mel Torme, Rosemary Clooney, Billy Eckstine, Mary Stallings, Jerry Hahn, Akira Tana, Jack DeJohnette, Weslia Whitfield, Mimi Fox, Larry Vuckovich, and Dave Ellis among others. Jewkes is an in-demand player. Akira Tana, producer of this CD, suggested the liner notes include the story of the first time the teenaged Jewkes saw Pres perform. Likewise, Tana urged me to share my boyhood encounters with Pres. My most memorable encounter with Pres occurred in Oakland's Chinatown. I had noticed a poster advertising a one-night stand featuring Pres and Billie Holiday at a beer joint named “Hamburger Gus's.” The entrance to Gus’s had swinging doors, open at the top about 18 inches. I had to check out this super gig, so I found a box to stand on and peered over the doors seeing the heads of Pres and Lady and digging the music. After the first set, Pres exited with a lady on each arm. Seeing me, he dropped the ladies, led me into the smoky joint, sat me on a stool by the stage and said, “The music will wind-up shortly... so dig it!” It was thrilling and unbelievable! Jewkes took the intros for “I Never Knew” and “I'll Never Be the Same” from original Pres recordings. The latter tune calls to mind the early recordings of pianist Teddy Wilson and Billie Holiday. On “If You Were Mine” Jewkes says: “I can hear Pres playing it in my head. Lester might have played it but he did not record it. Ditto for “Fine and Dandy,” which starts off as a slow ballad, then moves up to a medium swing tempo.” The derivation of “Moten Swing” is “You're Driving Me Crazy,” and it kicks off with the primary tune then segues into “Moten.” “D. B. Blues” has an uncommon structure - a bridge in a blues tune. The “D.B.” stands for the army detention barracks where Pres spent a year prior to his dishonorable discharge, and was a memory of the mistreatment he suffered in the U. S. Army. By the way, Jewkes' intro is different from Pres' on the same tune. “Lover Man” is associated with Billie Holiday. “I felt good playing it,” said Jewkes. Lester Young's classic signature tune, “Lester Leaps In” is played with a loose feel.